Tottenham have handed highly-rated young defender Kyle Walker-Peters a new contract until 2023, the club confirmed on Monday. Walker-Peters came through Spurs' academy and featured for the club for the 11th time on Saturday, replacing the injured Serge Aurier as they beat Leicester City 2-0. The right-back made 10 appearances in the first team last term and impressed with his technical ability and eagerness to get forward. Capped at Under-21 level and a world champion with England's Under-20s in 2017, Walker-Peters has long been seen as a future first-choice right-back for Spurs. With his future now seemingly secure until 2023, the defender's next target is surely usurping Kieran Trippier and Aurier to become Mauricio Pochettino's usual option on the right-hand side. 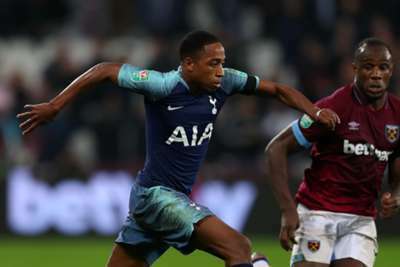 And he looks set to get his first opportunity to do so on Tuesday, with Pochettino suggesting Walker-Peters will start against Barcelona in the Champions League.